1) Press Button to sound the alarm and alert the authorities (actually, the first step of every set of emergency instructions anywhere in Taiwan is “Press Button”, which I found very funny). 2) If an object is blocking the train tracks, passengers should get out of the train and help clear the tracks. 3) Passengers outside of the train should take great care to not get hit by another train. The summary, in Tokyo a woman somehow fell onto the train tracks and became trapped under a train car. The station agent (someone, clearly, must have pressed the emergency button.. always step #1) held the train while the passengers collectively rocked the train car over to the side to make a space large enough to allow the woman to be rescued. The train then left the platform only having been delayed 8 minutes. Granted, this is Japan and not Taiwan, but they must have the same set of emergency instructions as shown above. Now… could the above have happened in America? I’m actually confident that yes, it actually could have happened. However, I’m also cynically confident that post-incident, the lady that fell would sue somebody over platform gaps, slick surfaces, inadequate warning sings, improper safety procedures, psychological trauma resulting from the incident, etc. Also, it’s likely inevitable that one of the passengers who helped move the train would also sue somebody for causing, or re-aggravating, a back/wrist injury. The end result of which would be some kind of monetary settlement, a forced re-examination of the train safety regulations and emergency instructions, and the posting of the new “revised” emergency instructions exhorting everybody to do absolutely nothing in case of an emergency (except, of course, for waiting for the authorities to come to the rescue). Sad yes..? But you all know that’s what would happen. Feel free to insert your own mental commentary on the situation and what it all might mean. 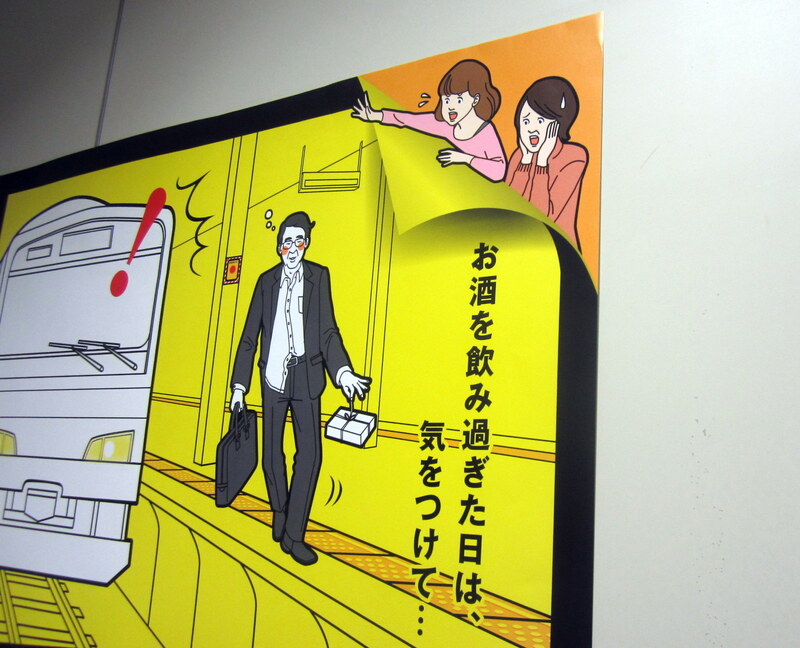 Apparently, other people have noticed this phenomenon as well… so much so that they need a warning sign in the train stations to exhort people to look out for drunken businessmen that might get hit by a train. Again, I’ll leave it up to you to make any possible connections about how the same society can simultaneously produce the above story and need the above warning sign. This entry was posted in Taiwan, US by Richard. Bookmark the permalink.